This topic contains 18 replies, has 9 voices, and was last updated by carbonita 5 months, 2 weeks ago. 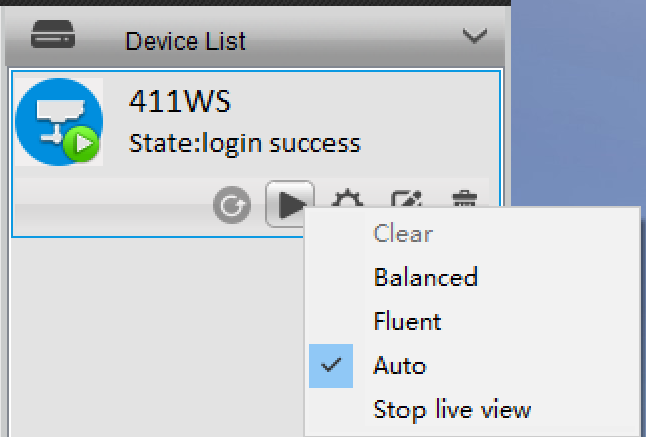 I can select balanced and it does change to that but when “auto” is selected it always displays the fluent stream. Is anyone else having this issue? so every time you choose “Auto” or other live view streaming type, it reverts to “Fluent” on the menu? may I ask what is your camera model and if you login camera on phone App or Web browser(s), will you see the same problem? Before your camera reverts back to “auto”, does your Reolink Client software go corrupt or no-response and you have to re-start it? I know that if the software is restarted, it will restore to auto. I have a different, but possibly related problem. I updated client to 7.2.2.7 and lost the live view completely. I updated the camera firmware to 2.0.0.675 hoping that would solve it. It did not. I still have no live view. I do have a little thumbnail view below “Video Clip Settings”, which I’m not sure that I had before. Can you ensure the live view problem only came along since you got the Client updated? How about Web and App login, are they normal or affected as well? Just want you to know there are no similar complaints from other users recently so we are trying to duplicate the problem but not able to yet. Any additional details you can provide here will assist in our helping you solve the issue. Yes, the problem occurred when I updated the client. Snapshot and video record functions both still work. Just no live view. I’m not using web or app views, so I can’t comment. I rolled back to client 7.1.2.44 and live view is back. I had upgraded to 7.2.2.7 trying to resolve hang and crash issues. This is running on an older i5 650 based machine with 4 GB RAM and Win 10 Pro. My problem is similar to Matt’s. On build 15063.138, client versions 7.1.2.44 and 7.2.2.7 display live view and playback view. On build 16179, client version 7.1.2.44 displays display live view and playback view. On build 16179, client version 7.2.2.7 does not show a cam view under live, playback or motion detection setup. Video Clip does display a view. Machines running ATI, Nvidia, and Intel video behave the same. No errors are identifies in the event viewer. The Intel driver on build 16179 rolled back to the version for build 15063 but did not help. The ATI and Nvidia drivers were the same for both builds. Videos, snapshots, and streaming are the same between the client versions and OS builds. The Android and Web versions show live and playback views. In the working cam view situations, the play resolution button which DocHolliday notes does not seem to change any of my cam view appearances. I suppose this should have been posted on the client group, but this thread seems active. I did notice the problem of it selecting Fluent, but am able to select any I prefer. If I select Clear, I get Clear. If I then select Auto, I get Clear. It just starts out at Fluent. That it starts out as Fluent will be fixed in future updates. Sorry for causing you inconvenience. We are also paying close attention to what DWW1505 said in his earlier notes and probably have it solved in the next-time update. Is there an update on this? I’m unfortunately having the same issue now. Can you have a simpe discription of the issue you are having? I’m actually using version 7.2.2.12 but having the same issue. When previewing four cameras at once it only shows a low resolution picture. No matter if I select balanced, fluent, or auto. If I am viewing one camera I get a high resolution picture. I don’t remember what version I was using before I went to 7.2.2.12 but I could get high resolution when viewing four cameras at once. I’m 99.9% sure it’s not a network issues. I’m hardwired all the way from the NVR to my computer with gigabit ports and CAT5E. 1. Four cams or 9, 16 cams in clear mode at the same time means significantly much more data to process for the computer. More RAM or advanced graphic card is demanded. The software may crash if the computer is inferior in configurations. 2. If you are accessing the camera or Reolink NVR remotely (from a outside network), the network is worse than when in LAN. All cameras in clear mode means so much data to transmit at the same time. Not wise because you may find yourself face all white images-all open failed. No a issue if in LAN, big issue if in WAN (outside network). Before I updated to 7.2.2.12 I was getting high resolution images on four cameras at once. Seems obvious to me that my computer and network can handle the amount of data needed. Is there a place I can find older versions of reolink software?